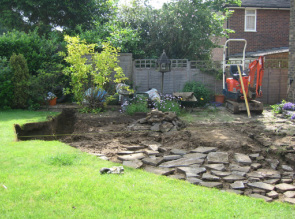 Additionally our services can include the management of the garden build. Once a design plan has been agreed with you the plan can be sent out to tender. We would recommend that 3 landscapers are asked to quote. Depending on your location, we would be happy to recommend contractors we use. Once a landscaper has been appointed we would then manage the build for you ensuring the plan is implemented properly and to the highest standard. Alternatively you may wish to use your own contractor.